Pie! Pie! Me oh my! I love me some pie- especially fruit ones! 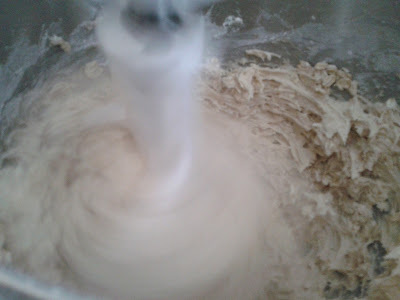 While eating pie pleasures my palate ,the simplicity of baking a pie nourishes my soul. 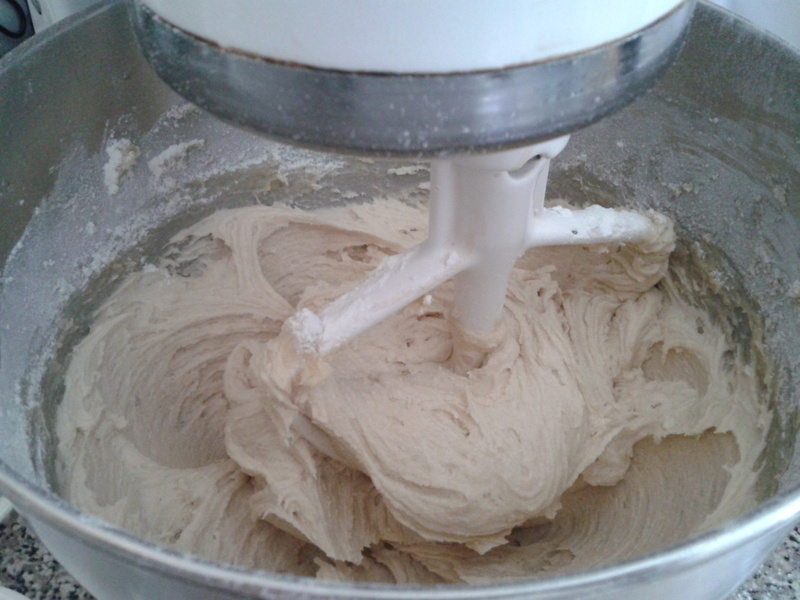 The rolling of the dough and the chopping of the fruit for the filling comforts me. I forget that I'm in the modern world. I escape to a more down-home, rustic existence. A few years back, I discovered hand pies. Oh, what a delight! If you never have had one, a hand pie is a pastry wrapped, fruit-filled, just the right size for a snack treat that can be eaten anywhere- a mini pie! Recently, on the most gorgeous summer day, I followed this recipe from Smitten Kitchen: Peach Hand Pies. Preparing these mini pies are a bit more work than a regular pie, but I don't mind. I can stay in my imaginary homespun world a little longer! Start with some sweet peaches. To peel the peaches, cut an X on the bottom, immerse in boiling water for about 45 seconds, and then place in an ice bath for 1 minute. Pat dry and peel. Slice in half and pit the peaches. Make sure you chop the peaches smaller than you would for a regular pie! The recipe called for 1 teaspoon of bourbon which I used but I couldn't taste it. Oh yum! Flaky crust and sweet peach filling! Anyone who bakes knows that you use a cup of this and a cup of that and before too long, you find that you have a lot of "this" and lot of "that" left over. You wonder what shall you do with "this and that"? 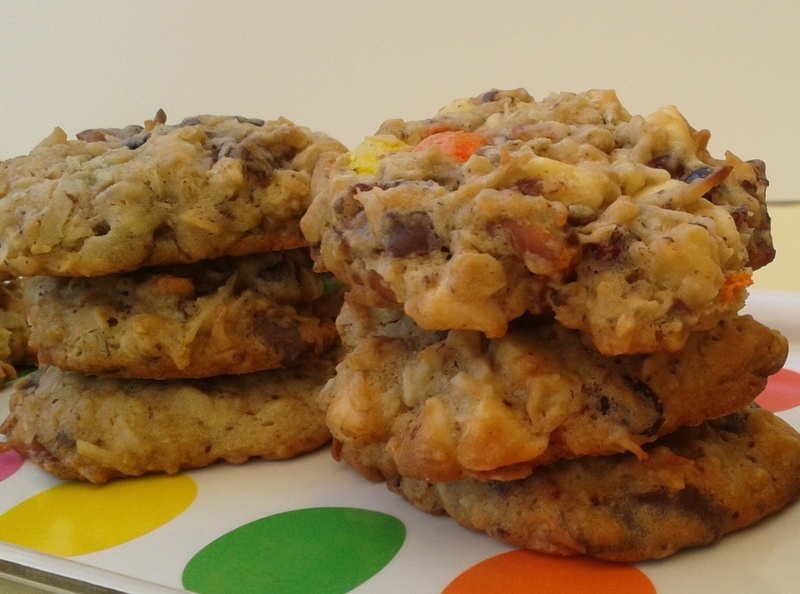 In my house, I make "Everything but the Kitchen Sink Cookies". I don't have a written recipe for these babies; I just throw the ingredients all together and hope for the best. 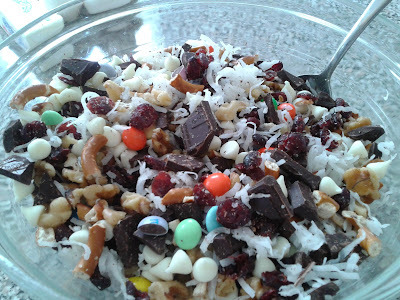 I started with all of the "this and that"- which was about a cup each of shredded coconut, M&Ms, dried cranberries, white chocolate chips, chopped bittersweet chocolate, walnuts, and chopped up pretzel chips. I whipped up a basic cookie batter which consisted of two sticks of butter (softened), a half cup each of white sugar and brown sugar, two eggs, and two teaspoons vanilla. 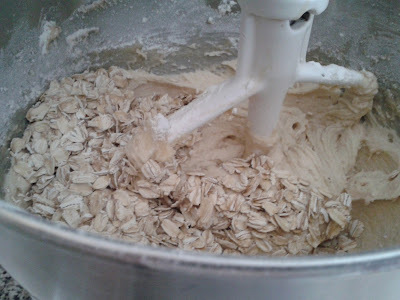 After that was beat together, I added the standard mix of two cups of flour with one teaspoon of baking soda, one half teaspoon of baking powder, and one teaspoon of salt. To make it even more exciting, I added two cups of oatmeal! WOW! Aren't you excited too? 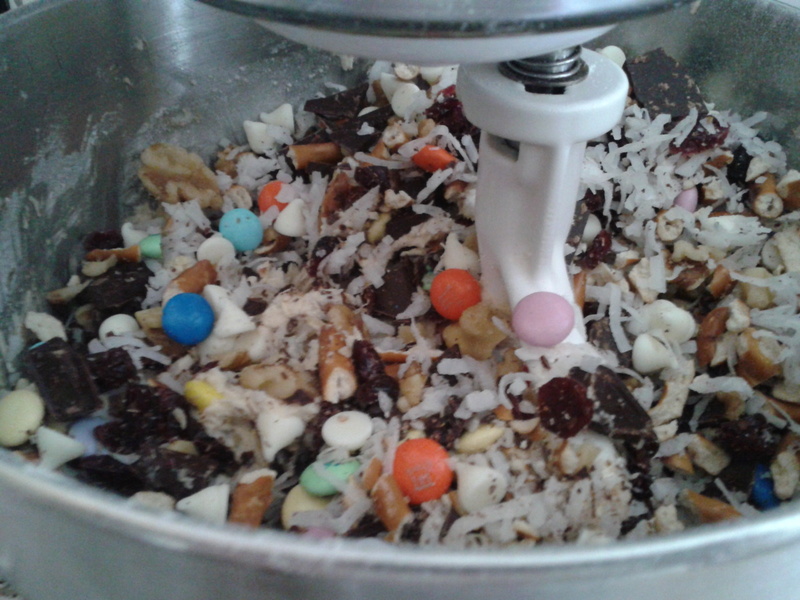 The final ingredients... that's right! "This and that"! ﻿I baked big scoops of the batter on cookie sheets in a preheated 350 degree (F) oven for about 12 minutes. (Uh, duh, I forgot to take a picture. You'll have to use your imagination.) 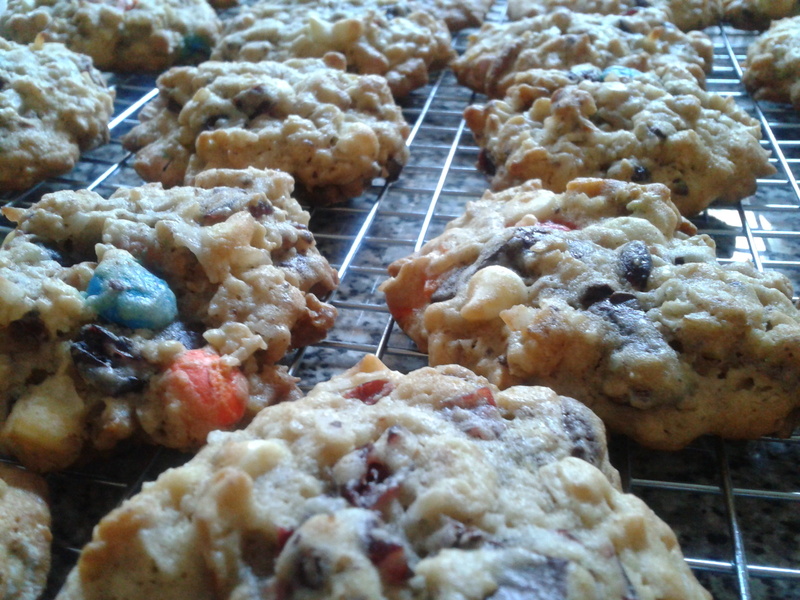 I then let the cookies sit on the cookie sheet for a minute or two to set. After that, onto the wire rack to cool. Luckily, I was able to take a few photos of the finished product before my kids ate them all up!! I also was able to eat one before they disappeared. 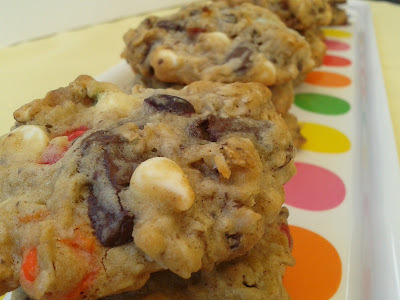 I think the cookies tasted pretty darn good for just winging it! 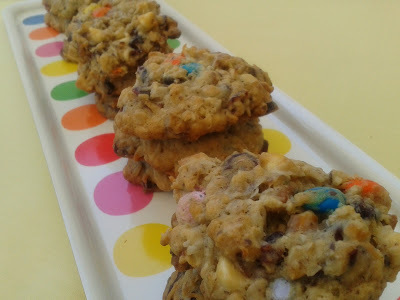 So next time you are in the mood for a sweet treat, take a look in your cabinet and throw all the sweets you have along with a little bit of a salty treat together to make these cookies, but remember- don't throw in the kitchen sink! I'm back! Actually, I haven't really gone anywhere. I guess you could say I took a vacation from technology for awhile. 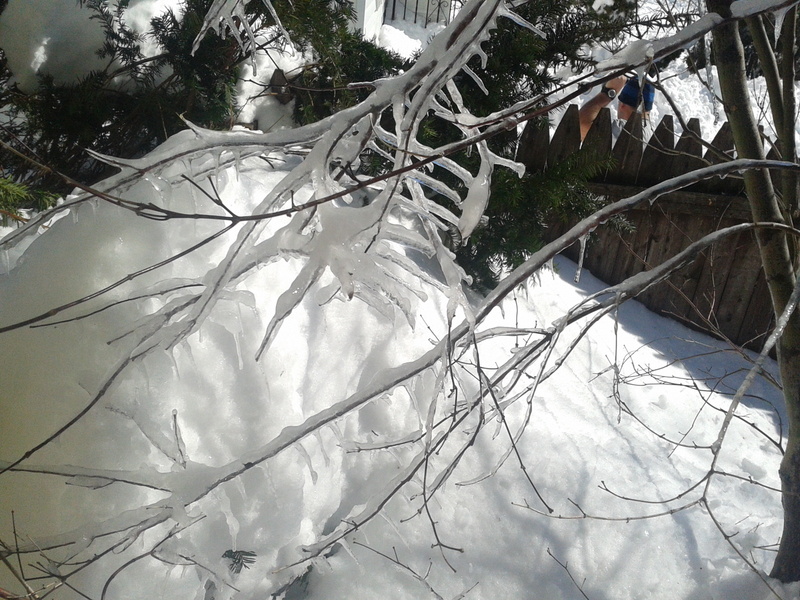 My last post was in the dead of winter and the mighty blizzard. Oh, that seems so long ago! Now the summer is here, and the heat has been incredibly unbearable. The temperature had been between 90 and 100 degrees Fahrenheit for the past couple of weeks. YUCK! Needless to say, not much baking has been going on. I bet now that you see this, you are saying "Nanu-Nanu" and spreading your fingers in greeting! (Yes...well... at least that is what I am doing). After that thought came to mind, the conversation between my sister and myself turned into complete silliness which, if you know the two of us, happens quite often. 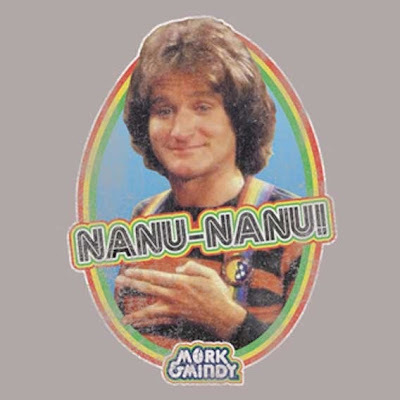 By the end of the phone call, Nanaimo Bars were dubbed "Nanu-Nanu" bars that were eaten by Mork from Ork. All silliness aside, my interest was piqued and I searched for a recipe. I found this one: Nanaimo Bars which also gives a little history to the origin of the recipe. One of the ingredients for these bars is vanilla custard powder. I never heard of this before but I was able to find it in the international section of my local grocery store. I made them and O CANADA! Nanaimo Bars are awesome! The bottom crust is chewy, the middle layer has a creamy pudding texture, and the top layer has a nice candy bar crunch to it! In fact, these bars are so good that I would have to say they are out of this world which means that "Nanu-Nanu" Bars is a great alternative name for them. After all, Mork was from another planet ;). Over the weekend, we had a little snowstorm. I happen to live in the town that is on record of having the most snow...40 inches!!! In fact, according to our mayor, this is the worst snowstorm in over a century. I have been in lots of snowstorms, and I can honestly say, I think the mayor's statement is right on target. Here's my deck about three hours into the storm. Here's my deck about six hours into the storm. Notice I had to move on to a yardstick. The snow was falling at about 3 to 4 inches an hour. Here's my deck after the blizzard was through. I had quite a time getting that door open. My hubby making a path down the backstairs. My son's car... he won't be driving until Spring! Jonas had to check out the snow. And, of course, Jonas had to pose in the snow. but I still love a good snowstorm! You can't control Mother Nature.